Egypt’s new government is due to be officially announced and sworn in by President Mohammed Mursi, who took office last month. Media reports suggest Prime Minister-designate Hisham Qandil’s government will be mostly technocrats, with at least two ministers from the previous government and a few Islamists. Former military ruler Mohammed Hussein Tantawi is set to be defence minister. Hisham Qandil has said “competence” would be the sole criterion for appointments. Speaking last week, he said he wanted “all political forces and the people of Egypt to support us in this difficult mission”, highlighting economic and social challenges. President Mohammed Mursi has been criticized for the time he has taken to name a prime minister and form a government since taking office in June. His nomination of Hisham Qandil, the outgoing water resources minister, surprised many observers, who had been expecting a well-known figure. On Wednesday, state media reported that the prime minister-designate had told Foreign Minister Mohammed Kamal Amr and Finance Minister Mumtaz al-Said that they would keep their posts. Maj-Gen Ahmed Jamal al-Din, the current assistant interior minister for security, was meanwhile asked to be interior minister, it added. “Given the circumstances that have been taking place in the country the coming period will need us all – the government and the people – to work together to maintain stability,” the general told reporters in Cairo. Officials also said Field Marshal Mohammed Hussein Tantawi, the head of the ruling Supreme Council of the Armed Forces (SCAF), would be defence minister, in line with an interim constitutional declaration issued after June’s presidential election run-off. The SCAF assumed presidential powers after Hosni Mubarak was forced to step down as president in February 2011. 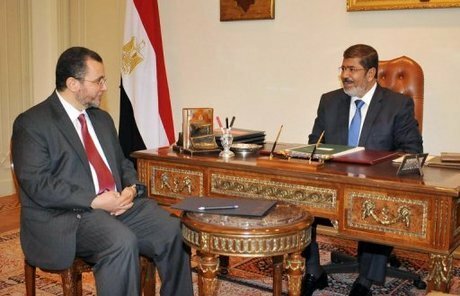 Its declaration and decision to dissolve parliament only days before caused outrage and overshadowed the nominal transfer of power to President Mohammed Mursi on 30 June. Of the 18 ministers named so far by state media, two are members of the Muslim Brotherhood’s Freedom and Justice Party (FJP), which Mohammed Mursi used to lead. Mustafa Musaad, who was responsible for educational policies during the president’s election campaign, will become education minister, while Tariq Wafiq, head of the FJP’s housing committee, will be housing minister. Another key post, the minister of religious endowments (Awqaf), went Osama al-Abd, the president of al-Azhar University. There had been speculation that an ultraconservative Salafist cleric, Mohammed Yusri Ibrahim, would be appointed.